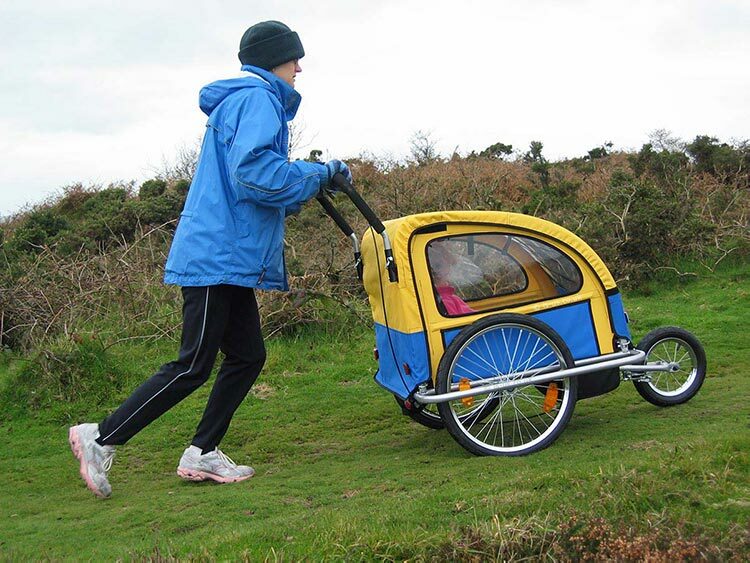 The Bicycle Jogger comprises of an additional kit of parts which fit on the Bike Trailer. These are a 12” Pneumatic front wheel, a push chair type handle and a ‘bicycle type’ handbrake. Compared to an ordinary push chair, there is little resistance when pushing or running, due to the larger wheels. This also means that it can be easily pushed on tracks and trails where push chairs would normally struggle. 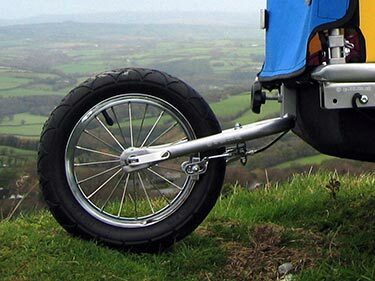 The ‘bicycle type’ handbrake is provided to help maintain your pace when on the move. The kit is easily removed when you want to attach the trailer to your bike and conveniently stores in the boot should you want to take it with you. The additional wheel slots into a socket on the front of the Bicycle Trailer and is held in place by a large knurled knob. The handle bar slots into the back of the Bicycle Trailer and is held in place by captive pins. We can provide a custom built safety strap that attaches to your wrist and the Bicycle Jogger with all our Jogging Kits. The Bicycle Jogger has a very low rolling resistance, therefore we want you to be permanently attached should you slip or stumble.